Mascha Rauschenbach and Katrin Paula’s article on electoral violence is now out on FirstView at Journal of Peace Research. using data from seven African countries, their research shows that incumbent supporters are targeted with clientelism, while swing and opposition voters are more likely to be intimidated with violence. The new encyclopaedia on pro-government militias, the guidebook, is now online. Please note that this site is under construction and that information for some groups is still missing as we continue to work on completing the guidebook. We have posted initial findings from our surveys on perceptions of peace in Sri Lanka, Nepal and Georgia. Updates of our ongoing work will be posted here as well. From 14-16 November we hosted a workshop on post-conflict intra-state peace and security. At this workshop we discussed early projects, including our initial findings from our surveys in Georgia, Sri Lanka and Nepal. The workshop brought together primarily young scholars from the US, Norway, Sweden, the UK and Germany. Click here for the programme. 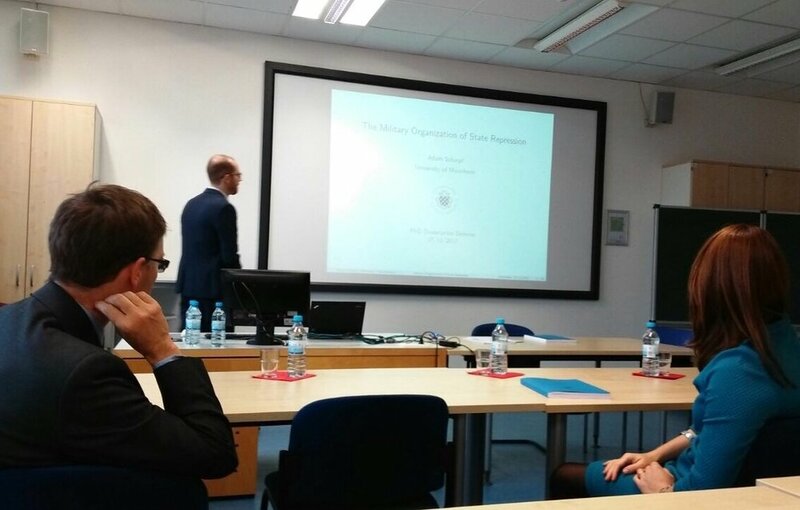 Sabine Carey was presented joint research with Belén González on how pro-government militias (PGMs) affect repression in post-war societies at the workshop on ‘Micro-level perspective on peace’ at the University of Birmingham, 19 September 2018, organised by Martin Ottoman and Felix Haass and at the APSA Annual Convention in Boston. In this paper, they show that PGMs are associated with higher levels of repression after an armed conflict, this deterioration in human rights is driven by militias that already existed in the preceding conflict rather than ones that newly formed in the post-war period. This is a new study by Christoph Steinert, Janina Steinert and Sabine Carey that shows that conflicts in which pro-government militias participate in the counterinsurgency campaign are more likely to break out again after they have been terminated; published open access in the Journal of Peace Research. We invite paper proposals for a workshop on Intra-State Peace & Security, to be held at the University of Mannheim, now 14-16 November 2018, and organised within the ERC Project RATE No 336019. At this workshop we aim to discuss ongoing research projects on intra-state peace and security, with specific focus on how political violence escalates, de-escalates, or does not escalate despite adverse conditions, such as in post-war societies. We are especially interested in work that assesses the nature and role of state institutions (including security forces) and civil society (particularly the media) in advancing or corrupting peace and the respect for human rights. We invite presentations and papers on questions such as how the role and legitimacy of the security forces and former warring parties changed in post-war settings, how institutions were modified to deal with political dissent and how citizens evaluate and trust political actors in (previously) volatile conditions. Limited funding for travel and accommodation is available. Please email your paper proposals to Sabine Carey by 15 July 2018. Adam Scharpf successfully defended his doctoral dissertation "The military organisation of state repression" on 27 November 2017. He passed his written dissertation and oral defense with the highest marks. The examination committee consisted of Sabine Carey, Kristian Skrede Gledtisch and Nikolay Marinov. Adam's dissertation provides important and novel insights into the question of how the military influences state repression during counterinsurgency wars. He uses different levels of analysis and generates novel data from an unusually large variety of sources to address the core question with innovative research designs. For his work he already received the Dina Zinnes Award 2016, the Stuart A. Bremer Award 2017 and the CDSS Young Scholar Award 2017. Sabine Carey is presenting a joint project with Anita Gohdes, University of Zurich, that aims to shed new insights into why journalists are killed by state authorities. She presents the paper at the Departmental Seminar Series at the University of Essex, Department of Government on 24 October 2017 and at Conflict Research Group at the London School of Economics and Political Science on 16 November 2017. Sabine Carey is presenting joint research with Belén González on post-war repression at the APSA Annual Convention in San Francisco, 30 August – 1 September 2017. As co-editor of the American Political Science Review she is also attending the APSR Board Meeting. Presentations at the workshop "Tactics in conflict"
At the workshop "Tactics in conflict" at the University of Konstanz, 27-28 July 2017, we present two of our ongoing projects. Belén González is presenting the paper "How to improve human rights in post-conflict settings: The role of accountability", co-authored with Sabine Carey. Adam Scharpf is presenting "Your behaviour drives me mad: How (non-)violent opposition tactics trigger military coups in counterinsurgency wars", co-authored with Belén González and Christian Gläßel.